The rocky relationship between Skullgirls publisher Autumn Games and co-publisher Konami has never been easy. 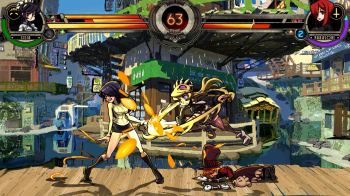 Patches to the PS3 and Xbox 360 versions of 2D fighting game Skullgirls have been due for some time. Back in October, Peter Bartholow, CEO of developer Lab Zero Games, wrote the developers needed help with Microsoft certification checks before rolling out the patches, but Konami had been "completely unresponsive." In an announcement to the game's Indiegogo page, Bartholow revealed Autumn Games and Konami have terminated their business relationship, meaning patches are on the way. "As it's been alluded to in the past, things have never been hunky-dory between Autumn Games and Konami," Bartholow wrote. "Around the time of the last update, it became clear it would not be possible to proceed with the new patches as long as Konami was involved with Skullgirls." Bartholow said testing on the patches is almost finished, but some changes need to be made before the patches can go live. Before submitting patches for certification, Skullgirls needs a new publisher in the system. Autumn Games will be listed as the sole publisher on the PlayStation Network. Autumn Games has already begun the process, and Bartholow expects the transition will be smooth, meaning a patch for the PS3 version is on the way. However, the patch for the Xbox 360 version will take more time to go live. This is because Microsoft does not support purely digital publishers. Autumn Games and MarvelousAQL, co-publisher of the PC version, are working toward a replacement Xbox Live Arcade publishing slot. "We apologize that these deep business dealings have come between you and the first character your collective efforts have funded," Bartholow concludes, "but we're confident that subsequent patches will go more smoothly with this all of this behind us."